Molecular Modeling and Drug Design Laboratory, Pharmacology Research Division, Bangladesh Council of Scientific & Industrial Research (BCSIR) Chittagong-4220, Bangladesh. cDepartment of Biochemistry and Biotechnology, University of Science & Technology Chittagong, Chittagong- 4202, Bangladesh. Human galectin protein 1 is one of the major carbohydrate-binding proteins and is the first member of this family which is responsible for nearly all types of cancer. Several studies have been conducted to inhibit this protein to treat cancer. However, due to the side effects of those inhibitors and also the pharmacodynamics and pharmacokinetics difficulties made these inhibitors to be less important and mostly avoided for treatment purposes. For this reason, this study was convinced to unveil the binding mechanism of two natural carbohydrate ring containing compounds, rutin and apigetrin, using computational approaches including molecular docking, binding energy calculation and ADME analysis. . According to the results, it was found that the residues, Val31, Ser29, Arg48, His44, Asn33, Glu71, Asn61 and Asp123 were involved in the interactions with the CRD domain of galectin-1. Apigetrin showed higher binding free energy than rutin in MM-GBSA binding energy calculation. ADME analysis revealed that, apigetrin showed better result than rutin for maximum parameters of ADME analysis. 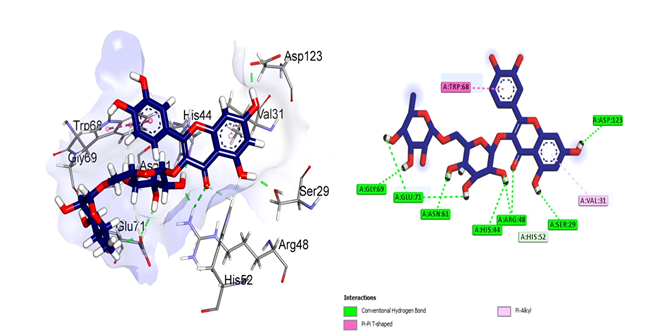 Taken together, apigetrin can be subjected for further analysis for the development of new inhibitor against human galectin-1 protein by in vitro and in vivo experiments. Carbohydrate-binding protein family includes galectin-1 with a conserved carbohydrate recognition domain (CRD) responsible for β-galactoside binding with around 130 amino acids [1-3]. The galectin-1 protein is encoded by the LSGALS1 gene and is located on the 22q12 chromosome . It is a monomer of 14 kda weight or a non-covalent homodimer with one CRD per subunit . Presence of multiple CRDs in homodimer makes it enable to perform cell adhesion function, intracellular signaling and also forming multivalent lattices with cell surface glycoconjugates . The structure and folding of galectin-1 protein contains a β sandwich with two anti-parallel β-sheets and exists as a dimer in solution . Galectin-1 is responsible for cell adhesion and migration  and also modulates several biological and cellular processes including cell proliferation , apoptosis  and m-RNA splicing . Galectin-1 was evident to be played functional roles in pathological processes such as pre-eclampsia, inflammation, diabetes, atherosclerosis and cancer [11-14]. To define tumor metastasis, altered cell adhesion, increased invasiveness and angiogenesis as well as evasion of the immune responses are well characterized . Over expression of galectin-1 protein has been reported in colon cancer , breast cancer , lung cancer , head and neck cancer , ovarian cancer , prostate cancer , gliomas , Kaposi’s sarcoma , myeloproliferative neoplasia  and Hodgkin’s lymphoma . By influencing and enhancing proangiogenic signaling pathways such as VEGF signaling, galectin-1 also regulates tumor angiogenesis [11, 26-28]. Inhibition of galectin-1 is now becomes a major target to treat cancer and several compounds were evaluated that blocks galectin-1 and its binding patterns [23, 29-34]. The major problems with these inhibitors involve the side effects of the inhibitors, for instances, synthetic lactulose amines, oligosaccharides derivatives, thiodigalactosides [29, 30, 33, 35]. Some inhibitors have high molecular weight and some with unknown affinity such as Davanat, TDG ester derivatives and anti-galectin monoclonal antibody [23, 31, 34]. The pharmacokinetics and pharmacodynamics difficulties make these inhibitors to be avoided . Natural compounds are now extensively used to treat various types of diseases, and 60-70% of drugs nowadays are derived from natural sources . Recently, about 30 natural compounds are in clinical trial to treat cancer . There are enormous pharmacological targets and natural compounds possesses pleiotropic nature by interacting with multitargets and therefore computer aided evaluation of natural compounds are promising in recent days . Lack of toxicity, low molecular weight, bioavailability and easy availability makes the natural compounds as a potential therapeutic agents . By considering this issue, the present study therefore aimed to analyze new compounds rutin and apigetrin as galectin-1 inhibitors (Figure 1). Rutin, also known as rutinoside (quercetin-3-O-rutinoside) is a natural flavonol glycoside consists of quercetin and disaccharide rutinose (α-L-rhamnopyranosyl-(1-6)-β-D-glucopyranose) have multitargeted mechanism to treat cancer . Rutin reported to exhibit several biochemical and pharmacological activities like free radical scavenging activity , reduction of inflammatory responses and anticarcinogenic properties . Apigetrin, or apigetrin-7-O-glucoside, a monosaccharide derivative, has already been reported to inhibit cancer in previous study by analyzing binding free energy calculation and molecular docking against several drug targets . Although monosaccharides have lower affinity than di or oligosaccharides to galectins [45, 46], however, monosaccharides based inhibitors provide higher ligand efficiency and glycolytic property and could increase bioavailability and uptake . As results, this study considered both di and monosaccharids to evaluate their affinity and ligand binding efficiency as well as their inhibitory activity against galectin 1 protein by molecular docking analysis, binding free energy calculation by MM-GBSA analysis and pharmacokinetics properties analysis by ADME. In order to perform molecular docking analysis, at first, retrieval of the three dimensional crystal structure of the human galectin-1 (PDB ID 3T2T) in PBD format from the protein data bank was accomplished . Protein Preparation Wizard of Schrödinger-Maestro v9.4 was used for the preparation and refinement of the downloaded protein . Charges and bond orders were assigned and water molecules were deleted. Hydrogens were added to the heavy atoms. Energy minimization was done by using OPLS 2005 force field by fixing the heavy atom RMSD of 0.30Å . Amino acids were optimized by using neutral pH. From the Pubchem database the 3D structure of the apigetrin (Pubchem ID; CID 5280704; Molecular formula; C21H20O10) and rutin (Pubchem ID; CID 5280805; Molecular formula; C27H30O16) was downloaded. Ligand preparation was done to create three dimensional geometries and to assign proper bond orders . Three dimensional geometries were generated by using Ligprep2.5 in Schrödinger Suite 2013 with an OPLS_2005 force field . For the generation of ionization states, we used Epik2.2 in Schrödinger Suite at pH7.0±2.0 . A maximum of 32 possible stereoisomers per ligand were obtained. During docking trajectory the every poses binds to the predicted active site that’s why receptor grids were calculated for the prepared protein. For Glide docking, grids were generated by using OLPS 2001 force field by keeping the van der Waals scaling factor of 1.0 and charge cutoff value of 0.25. A box was generated to each direction with 14 Å × 14 Å × 14 Å for docking experiments. XP ligand docking was performed rather than SP docking because XP is better than SP in scoring function and it also predicts the false positive results . This docking was performed in Glide of Schrödinger-Maestro v9.4 . Final result of docking can be found as glide score by energy minimization. For docking, van der Waals scaling factor was set to 0.85 and 0.15 for ligand compounds and partial charges cutoff value was fixed at -10.0 kcal/mole. The lowest glide score containing compounds were then subjected to MM-GBSA analysis for binding free energy calculation and best poses were recorded for every ligand compounds. For the analysis of physiological descriptors of a compound such as adsorption, distribution, metabolism and excretion behavior of the ligand compounds ADME analysis was done in QikProp module of Schrodinger . It also predicts the physicochemical nature of the compounds as well as their pharmacokinetics properties. In this study, we used the Qikprop 3.2 module of Schrodinger . There are also several other descriptors also analyzed such as Predicted IC50 for blocking HERG K+ channel in vitro, predicted octanol or water partition coefficient [log P(o/w)], number of hydrogen bond acceptors (HBA), number of hydrogen bond donors (HBD), predicted aqueous solubility (log s), solvent-accessible surface area (SASA), skin permeability (log Kp), MDCK cell permeability (MDCK), binding to human serum albumin (log Khsa), blood-brain partition coefficient (logBB), percentage human oral absorption rate. The first compound rutin (Figure 2) formed seven conventional hydrogen bonds with Gly69, Glu71, Asn61, His44, Arg48, Ser29 and Asp123 residues where Arg48 made double hydrogen bonds. Glu71 also made double bonds while Pi-alkyl bond was observed for Val31. Trp68 made one pi-pi T stacked bond. The second compound apigetrin (Figure 3), on the other hand, made five hydrogen bonds such as Asn33, Lys63, Glu71, Tyr119 and Asp123. All of them showed single bond except Tyr119 who made two conventional hydrogen bonds. His44 made two pi-pi stacked bonds while Val31 made two pi-alkyl bonds. From the previously published crystal structure of the Human galectin-1 protein it was found that the protein has 10 residues in CRD domain which consists of His52, Arg48, Asn46, Ser29, Asp123, Val31, His44, Asn33, Glu71 and Asn61 . For the stabilization of ligand compound with the protein molecule, interaction should be made between His44, Asn46, Arg48, His52, Asn61, Trp68, Glu71 and Arg73 residues . From our analysis, we found that the targeted ligands were able to make contact with nearly all of the residues in the CRD domain. The interactions made by corresponded ligands with Val31, Ser29, Arg48, His44, Asn33, Glu71, Asn61 and Asp123 residues imply that they can successfully block the CRD domain of the protein. In another study, human galectin-1 protein in complex with thiodigalactoside (TDG) revealed that, the disaccharide TDG, made hydrogen bond with Glu71 and pi-stacked bond with Trp68, which evidently supports our study . The targeted ligands in this study also made hydrogen bond with Glu71 and pi-stacked bond with Trp68. However, TDG made two additional hydrogen bonds with Asp54 and Arg73 where Asp54 is not involved in the active site of the CRD domain. Interestingly, the ligands of this study, made hydrogen bonds with Asn61, His44, Arg48, Ser29, Asp123 and Asn33. These residues were involved in ligand binding efficiency of CRD domain. Thus this study showed greater binding efficiency of ligands toward the galectin-1 protein than the previous study. Another experiment, involved interactions between galetin-1 protein with thiodigalactoside derivative, TDG139, where interactions were made by Ser29, Val31, Asp54, Arg73, Glu71, Arg48 and Asn46 residues . Ligands of this experiment made common interactions by Ser29, Val31, Arg48 and Glu71 residues, which were also supported by previous study. A study was carried out to investigate the interaction pattern of galetin-1 protein with type 1 N-acetyllactosamine . Hydrogen bonds were observed for His44, His52, Arg48, Arg73, Trp68 and Asp54 residues. Trp68 also made van der Waals interaction. In this study, interactions were analyzed for three residues in common such as Arg48, His44 and Trp68 residues. Overall, this study shared most of the residues that were investigated to be involved in the interactions between galectin-1 protein and other published ligand complexes thus indicating the potentiality of rutin and apigetrin as galectin-1 inhibitor. According to the MM-GBSA analysis it was found that, the compound rutin had a binding free energy of -44.04 kcal/mol, whereas the compound apigetrin exhibited a binding free energy of -47.35 kcal/mol (Table 1). From the result, it can be easily observed that, apigetrin has the greater binding free energy than rutin thus showed stronger binding than rutin. In case of coulomb energy, rutin showed the value of -30.44 kcal/mol and apigetrin showed -29.44 kcal/mol. The packing energy released for rutin ligand was less (-4.24 kcal/mol) than the packing energy of apigetrin (-7.12 kcal/mol). Energy released during van der Waals interaction was also lower in case of rutin which was -28.68 kcal/mol and for apigetrin it was -35.00 kcal/mol. From the MM-GBSA analysis it was found that, the apigetrin exhibited higher binding free energy than rutin which has stronger affinity for binding with human galectine-1 protein than rutin. Monosaccharide (Apigetrin) showed better ligand binding efficiency than disaccharide (Rutin) according to the binding free energy calculation of this study. The ADME properties of both rutin and apigetrin were evaluated to explain their pharmacokinetic properties. Table 2 illustrates ADME properties of these two compounds. The properties represent the bioavailability, distribution, cell permeability, excretion and absorption quality of the compounds. From the results of ADME analysis, it was observed that, the blood or brain barrier permeability of the tested compounds was nearly between the acceptable ranges which is very important for a drug to pass through those barriers. Apigetrin showed QPlogBB value of -3.151 which is a better than rutin (-4.728) where the acceptable range is -3.0 to 1.2. The number of hydrogen bonds donor and acceptor are in the value of acceptable range and solvent-accessible surface area (SASA) also showed acceptable value. Predicted IC50 value for blocking HERG K+ channel was very close to the acceptable range for both rutin (-5.288) and apigetrin (-5.799). The predicted octanol or water partition coefficient for rutin and apigetrin were also analyzed. Apigetrin showed better result than rutin by providing the acceptable value of -0.307 where Rutin showed -2.57 value where the acceptable range is -2.0 to 6.5. Human oral absorption rate was also greater for apigetrin (30%) than rutin (0%) according to the findings of this study. In case of cell permeability, apigetrin again showed better result than rutin, which is a very important parameter for a drug to pass through the cell to be active. Skin permeability was near to the acceptable range for both rutin and apigetrin. Human galectin-1 is now become a promising target to treat cancer. According to our study, the apigetrin and rutin occupied the CRD domain of the galectin-1 by interacting with most of the residues of CRD domain such as Val31, Ser29, Arg48, His44, Asn33, Glu71, Asn61 and Asp123 which were also supported by previous studies thus can inhibit the galectin-1. Apigetrin also showed 30% of human oral consumption rate which is in medium level quality as well as exhibit better quality as a drug than rutin in most of the parameters of ADME analysis. Thus further in vivo study is needed to evaluate the quality of the apigetrin as a drug compound and its inhibitory activity. 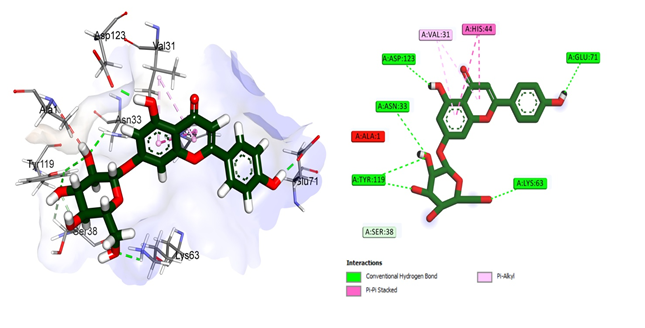 Dash, R., et al., In silico analysis of indole-3-carbinol and its metabolite DIM as EGFR tyrosine kinase inhibitors in platinum resistant ovarian cancer vis a vis ADME/T property analysis. 2015. Wizard, P.P., Epik version 2.2, Impact version 5.7, Prime version 3. New York, NY: Schrödinger, LLC, 2011. Sharma, V., et al., Structure based rational drug design of selective phosphodiesterase-4 ligands as anti-inflammatory molecules. Bull. Pharm. Res, 2011. 1(2): p. 33-40.